One Stroke Golf only collects data aggregated from our hosting company. This may or may not include IP address which would provide us with your geographic region. This is NOT shared with anyone. If we ask for your email address, it’s to send email email to you intentionally and complaint with the rules and regulations set forth by governing bodies. You can always opt out of any communication from this website and we certainly appreciate your readership and more importantly, your privacy. 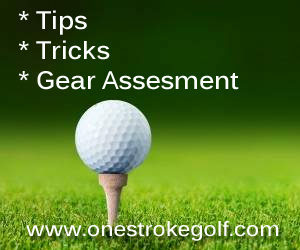 One Stroke Golf will often review products pertaining to the content of the web site. In order to maintain the costs associated with managing One Stroke Golf such as hosting and other offset expenses that come with operating the site, we do also reserve the right to earn money with affiliate programs. That said, we may earn a commission if you purchase a product you see on this sight and buy the product on Amazon.com, or even directly from a manufacturer.